Beijing’s reputation for terrible air quality has travelled far and wide. Most recently, a wave of heavy smog hit the city, exciting another stream of complaints, including remarks from a world class tennis player stationed in the capital for the China Open. China’s Bureau of Meteorology released a yellow smog warning for Sept. 29, saying the Air Pollution Index (API) reached a level of four in most areas of northern China. Elsewhere around Beijing the API was five, meaning serious pollution. The Bureau of Meteorology suggested people wear masks when outside, and go outside less. A Beijing resident, giving the surname Fu, told Epoch Times that he can’t see well when driving. “Beijing’s air is not good recent few days. I have only been able to see 5 or 6 meters in front of my car since the 28th. It’s heavily overcast. I have to wear a mask,” he said on the telephone. Over 3,000 comments under the post mocked it, and called it a “rumour.” (The Chinese authorities have recently launched a campaign against what they call rumours on the Internet.) “Lying!” “So despicable!” “Don’t you feel ashamed to say that!” were frequent refrains by those who commented. 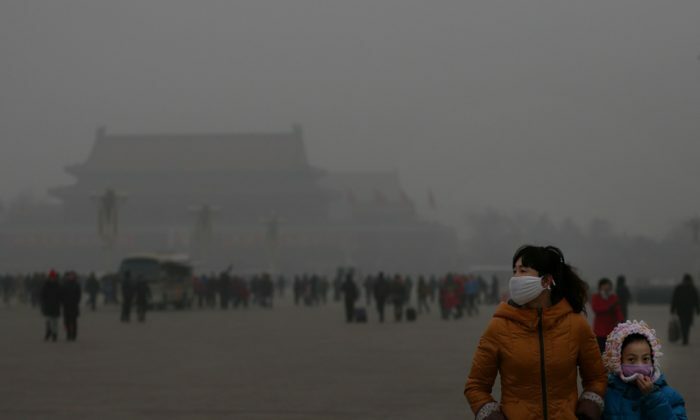 This year is particularly bad for air in Beijing, Lindstedt wrote on his blog. “We spend most of our time at the hotel since we don’t want to go out in the bad air. But if I should be honest, this year has been worse than the other years,” he said. At least two other tennis players — Anastasia Pavlyuchenkova and Dejan Petković — had to pause their games because they felt dizzy and sick, according to Phoenix Television, which is based in Hong Kong. Chinese Internet users remarked that they must have been choked by the bad air.